Whether Doing a complex project like a home renovation or a simple one like a DIY project, a rotary tool can be your reliable companion. This simple, but robust tool allows you to do cutting, polishing, sanding and more feature. Asides from its multifunctional part, high speed is a spanking feature of it. In the early 40’s decade, Dremel rotary tool was introduced by Alfred Dremel and became very popular for its high speed and stability. It was a revolutionary introduction indeed because of its multi-functional units. Even today There is a lot of demands of original Dremel moto-tool because of its stable service and variety of application like from engraving designs to polishing metal and cutting/shaping materials. In this article, we have discussed on 3 popular models of Dremel rotary tools - let's see which tools wins on Dremel 4300 vs Dremel 4200 vs Dremel 4000 reviews. 3.1 3. Gatorback B145 Carpenters Triple Combo w/Pro-Comfort Back Support Belt. The Dremel 4300 is the most robust and unique one that allows tool-less and collect-less accessory changes including of three-jaw-chuck. The chuck fits for all Dremel accessory shank sizes with advantageous changes without helping of the wrench. This three-jaw-chuck makes it awesome and compatible with the other brands and accessories. 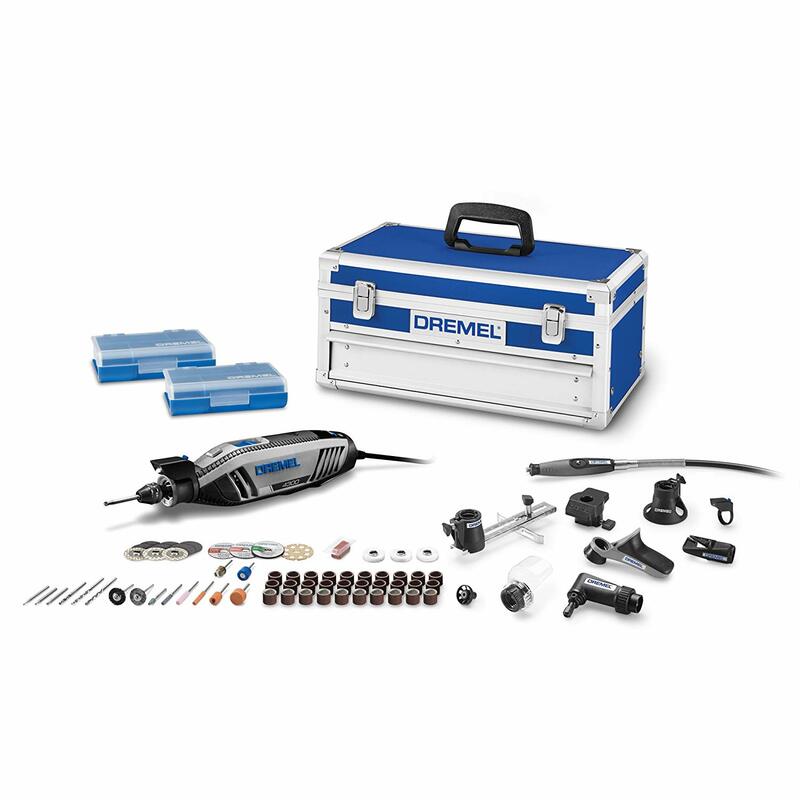 The widest range of Dremel accessories is fit to the 3-jaw-chuck. Speed range varies from 5000 RPM to 35000 RPM. That is cool enough indeed. Rotating pivot light provides satisfactory illumination to see what you work. Impressive and Running Ball bearing allows you a smooth and quiet operational and user experience. Manufacturers provide 2 years warranty. No requirement of the battery to operate. The product contains Universal 3 Jaw Chuck, 9 attachments, and 64 accessories. Unique flex shaft to ensure high speed. Improved airflow ensures running of Quieter and cooler. Powerful motor for effective performanc. 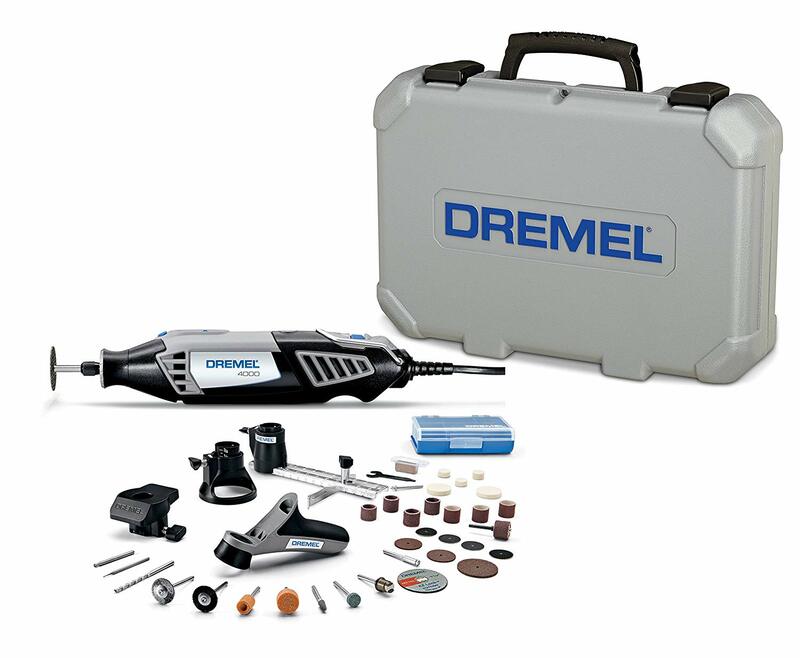 Most attachments and accessories are fit for other Dremel rotary tool. Speed control dial adds convenience during perating the machine. Motors are replicable, so it extends the tool life. 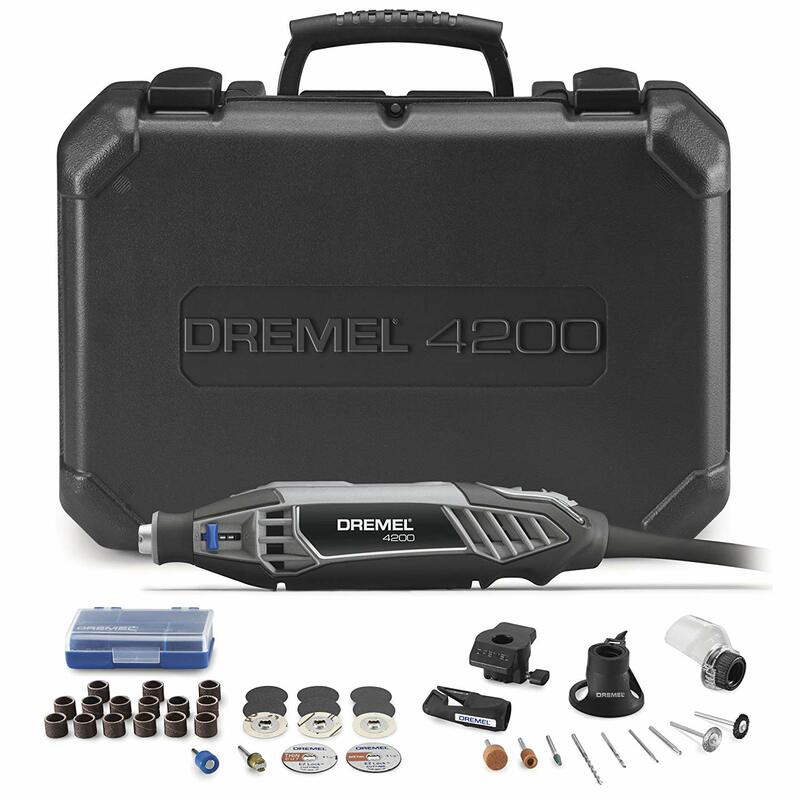 The Dremel 4200 variable speed rotary tool is the first one including the EZ change mechanism that allows the quickest and easiest accessory change. Obviously, you can change the accessory without a wrench with the innovative EZ change system. It helps to achieve your target and save your time in completing any project. You can use accessories of others model similar to the Dremel 4200. Versatile and multi-functional use allows you an enjoyable and smooth journey of work. Patented EZ change mechanism ensures a super easy change of accessories without using a wrench and adds value to your work. High-performance stable motor ensures you speedy experience. Speed variability for versatile use. The tool of another model of Dremel are compatible with this one. So, it saves your expenses. Replacement facility of motor brushes extended the tool life. Industry oriented, reliable and quick response customer service. Speed variability from 5000 to 35000 RPM. 4 attachments and 36 accessories are attached for versatility. 3. Gatorback B145 Carpenters Triple Combo w/Pro-Comfort Back Support Belt. The Dremel 4000 variable speed rotary tool is the most versatile and providing the highest performance among all the Dremel tools. Electronic feedback circuitry and increased strength of motor deliver the consistent performance at all variability of speeds. A 360-degree grip zone with an ergonomic body allows controlling the machine in any position. Separate on/off switch with variable speed dial switch offers you the convenience of controlling and adjustment of speed. 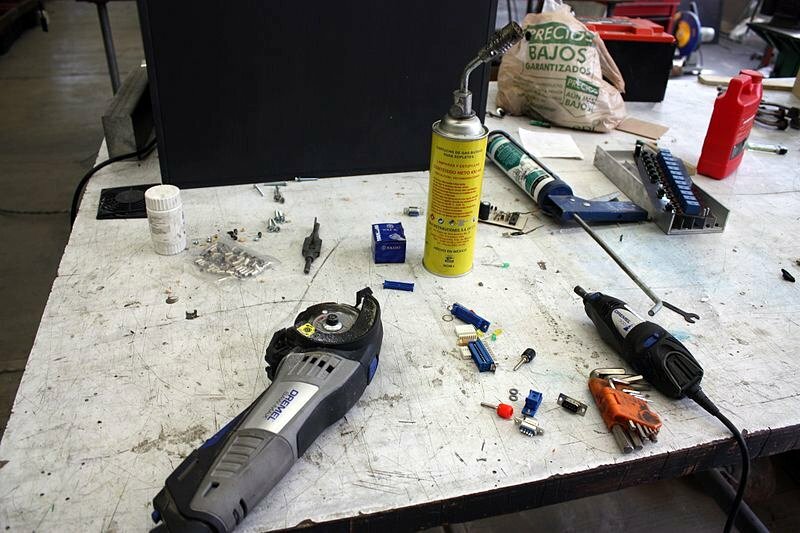 Another convenience is you can use other accessories of Dremel models in Dremel 4000. Speed variability from 5000 RPM to 35000 RPM. Compatibility with all other Dremel accessories and attachment for the specific part. 50 accessories are added that is maximum in this budget. 360-degree grip zone for smooth and control the machine from any angle. Super safe carrying case with an adequate facility. 6 Ft cord allows you more flexibility. Separate on/off along with speed control switch. EZ twist nose cap accessory change system. Prompt and reliable customer service. Wear eye protection with a variety of metal cutting discs. Come with a flex shaft. All the 3 models of Dremel Rotary tools was highly acclaimed for excellent performance. However, you aren't definitely buying all of those tools at a time. That's why it's wise to select your rotary tools based on your requirements.